Hello. It's Adele and Jimmy Fallon rocking her song. Hello. 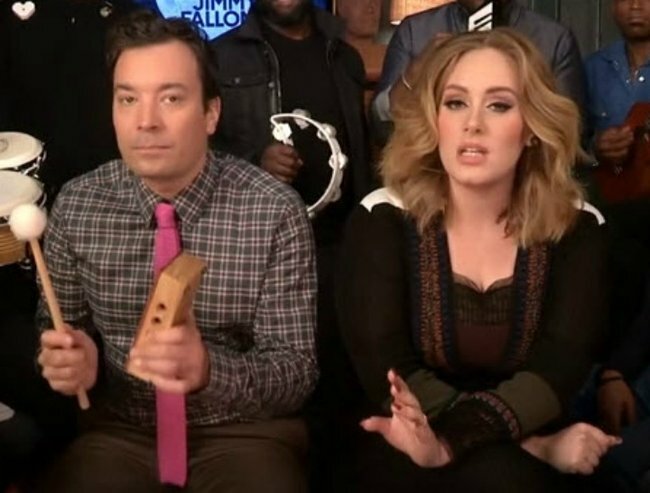 It's Adele and Jimmy Fallon rocking her song with classroom instruments. But where are the triangles? Just when you’ve managed to put away the tissues and clean yourself up after listening to Adele’s ‘Hello’ on repeat while crying into your pillow, she goes and makes another version. In a slightly more upbeat take on the tune, the songstress — whose new album 25 has sold more than 2.4 million copies in the US in less than four days — was joined by comedian Jimmy Fallon and American hip hop band The Roots for a more rustic remake involving classroom instruments. Yep, the tambourine, the bongo, the xylophone and several other instruments I’ve forgotten the name of all got a run. (But, sadly, there were no triangles or recorders to be seen). The result is surprisingly good.